Jonathan Underhill is a specialist criminal and regulatory barrister who joined 3PB in January 2019, having practised from chambers in London and Southampton. He is noted for his excellent approach to client care, thorough preparation and first class advocacy and representation at all levels from the lay bench to the High Court. Jonathan both defends and prosecutes individuals and companies across a range of complex regulatory matters. His practice has a particular emphasis on breaches of consumer protection, health and safety, planning enforcement and environmental legislation. In addition to his specific and longstanding expertise in financial crime and Proceeds of Crime Act matters, Jonathan has a growing interest and experience in white collar criminal work, notably fraud and financial regulation and has assisted on an international prosecution concerning alleged fixing of financial rates involving some of the largest global financial institutions and banks. Jonathan is a Level 3 CPS Panel Advocate, a Level 2 CPS Specialist Panel Advocate on their Proceeds of Crime Panel and is a member of the Serious Fraud Office Review Panel. Jonathan is routinely called upon to deal with complex issues often involving large amounts of digital, forensic and financial evidence and detailed analysis. He has been a led Junior for both Prosecution and Defence and has significant experience in both applying for and defending a wide range of Ancillary Orders including confiscation, restraint and destruction orders, DVPO, SHRO and SHPO’s. Operation ‘Buntline’ (2017) – Instructed for the Defence in large multi-handed country wide conspiracy to supply class A drugs – involving ANPR, and nationwide telephone and telemetry evidence. R v. A – Successful prosecution of multi-handed case of possession with intent to supply Class A drugs. Operation Glenfall (2018/2019) – Instructed as Led Prosecution Junior in a 31 handed perverting the course of justice case. R v. M and Others (2018) – Instructed as Led Junior Counsel in multi handed cash in transit robber case. R v. S (2017) – Represented a member of a gang who burgled the home of England footballer John Terry and a number of other High-profile victims. R v. K (2017) – Case concerning people smuggling across European Borders. R v. J – Led Junior for the Defence in an attempted murder case. R v. A – Transfer of a firearm. Statutory defence as to the antique nature of the weapon (s58(2)). Conflicting expert evidence. R v. S – Successful acquittal of client in Multiple Burglary counts despite the Defendant not attending and the trial proceeding in absence. R v. B – Multi handed – Joint enterprise – Night time robbery. R. (on the application of Hovenden) v. Parole Board  EWHC 3738 (Admin) – Judicial Review against decision of the Parole Board. Jonathan is regularly instructed to act for the Specialist Fraud Division of the Crown Prosecution Service, as well as HMRC most often in relation to Social Security and computer-based frauds. He has also undertaken disclosure and review work for both the Serious Fraud Office and National Crime Agency. Jonathan has also been sought out to advise on other less common frauds pertaining to local authorities and business regulation; notably “airport parking” and “blue badge” fraud. He has particular expertise in handling the restraint, confiscation and asset recovery aspect of cases centring on financial misconduct. Operation ‘Barren’ (2019) – Instructed for the Defence in a multi-handed fraud prosecuted by HMRC valued at £3.4 million. Operation ‘Z’ (2018) – Instructed as Led Junior Counsel in a multi handed money laundering case. R v. C (2018) – HMRC, failure to declare self-assessment Income tax and NOI contributions; circa £170,000. R v. S (2018) – Successfully Defended in “failing to declare case” brought by HMRC, concerning income from multiple properties on the South Coast. R v. C (2017) – Instructed for the Defence solely to deal with contested POCA proceedings arising from large scale drug dealing. R v PE and Ors (2016) – Instructed to advise pre-charge on large scale multi-company, multi-site airport parking fraud valued at several hundred thousand pounds. R(S) v. Q and Others – Led Junior for the prosecution in four handed 6-week conspiracy to defraud case involving council tax, housing benefit and identity fraud. R v. B and Ors – Instructed on behalf of third-party insurance company to provide detailed legal advice on arguments pertaining to the Defendants having “obtained” property; detailed noting brief required of multi day contested hearing. R(S) v. Q and Others – POCA confiscation. Lifestyle assumptions, multiple properties, bank accounts, hidden asserts, assertion of third-party rights and assets outside of the jurisdiction. WSS v. D – Trading Standards confiscation, legal argument as to the effect of proportionality and R v Waya as relating to tainted gifts and third-party property rights. R v. S – Prosecution of complex case involving fraudulent “shopping vouchers”. HCC v. C – Multi-handed prosecution regarding fraudulent business and roofing fraud. PCC v. A and Ors – Multi-handed prosecution of local Police employees for secondary selling of parking vouchers and fraud. R v. N – Benefit Fraud valued at £50,000. R v. I – Benefit Fraud valued at £28,000. Jonathan has developed an expertise in dealing with all financial matters ancillary to his specialist areas of practice. Jonathan regularly deals with Proceeds and of Crime, Restraint and Confiscation Orders, and is regularly instructed, for the Defence, Prosecution, Police Force and HMRC from initial seizure and forfeiture to contested final hearings. Jonathan has also acted for interested third parties, including private individuals and insurance companies, both to provide advice in relation to rights and standing, as well as providing detailed assistance by way of noting briefs and written application and submissions. R v. X (2018) – Instructed to advise on the rights and interest of third parties involved in confiscation where assets were potentially covered under constructive trust. R v. B (2018) – Legal argument concerning the proper statutory interpretation of the re-assessment of available assets following further conviction. HB v. A (2018/19) – Multi-Property Planning Enforcement and Environmental Breach Prosecution, leading to PoCA application valued at circ. £300,000. HB v. M and A (2019) – Advertising and Planning enforcement Appeal against conviction and sentence. PCC v. K (2018) – Long term parking fraud concerning fraudulent parking permits and mis-use of “blue badges”. HB v. T (2018) – Multi Defendant Fly-Tipping Prosecution against both individuals and limited companies. Grenfell Inquiry (2018) – Instructed to assist Local Authority in preparation for the inquiry. HB v. MK (2018) – Multiple outlet breach of smoking ban prosecution – legal argument as to proper application of statute. HB v. A (2018) – Multi Defendant, Multiple breaches of Improvement notices over significant periods of time effecting multiple tenants and requiring Local Authority involvement. LBH v. K (2018) – Persistent and escalating breach of environmental legislation pertaining to fast food and animal waste in central London. R v. X (2017) – Instructed for the Defence in food hygiene case involving breaches of European and Domestic regulation. Operation ‘Foxchase’ – Instructed as led Junior in a complex national secondary ticketing trading standards case. Operation ‘Hugo’ – Trading Standards case involving importation of farmed puppies, featured on BBC programming. Operation ‘Wendelin’ – Multi handed Trading standards prosecution of rouge traders involving 15 complainants. R(BDBC) v. FF and Ors – Multi handed Food safety case involving multiple breaches of Regulatory provisions, hygiene improvement and prohibition orders. R (SCC) v. K – Education case involving argument re: Isle of Wight v Platt  UKSC. R v. S – Trading Standards prosecution against persistent street peddler. R v. M – Trading standard prosecution involving Trademark offences against the Premier League, British Legion and Help for Heroes. R v. A – Trading standards Prosecution involving several thousand pounds of counterfeit tobacco. 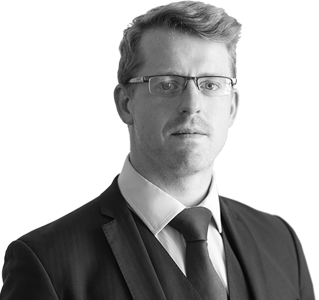 “I am indebted to Mr Jonathan Underhill…for his realistic and concise submissions… Mr Underhill was utterly realistic in his submissions to this court, which he advanced with commendable brevity and good sense”. “I was very impressed with Jonathan Underhill – and he had a glowing report from our environmental health manager for his advocacy at the recent noise trial he did for us”. "Very clearly presented - a dry subject made interesting. Very useful info. Excellent trainer". "Very informative, clear, concise but with a level of relaxed delivery and humour. I enjoyed Jonathan's 'style'."